Asking investors what they do for a living is not done out of idle curiosity, or just to make conversation. Spectrem research shows how occupation affects and in some ways determines how investors will choose to invest. Investors from different occupations also view their financial situation differently, even when they are in the same wealth segment. While investors in one occupation will see their wealth level as a comfort zone, investors in another occupation will see that same wealth level as insufficient. As part of its continuing research into affluent investors, Spectrem compiled a year’s worth of data to look at the personal financial outlook of Educators, one of the most popular occupations among affluent investors in all wealth segments. The result, Getting Schooled on Educators, is an in-depth examination of investors from that occupation, including teachers from all ages and academic levels of instruction. All signs point to Educators being more careful with their investments and less likely to take investment risks. Educators are more likely to want a guaranteed rate of return on investments rather than risk principal for a higher rate of return. In some cases, Educators indicate less optimism about their finances than do investors from other occupations. Only 55 percent of Educators believe their financial situation has improved over the previous year, compared to 59 percent of all investors. Even more demonstrative is the fact that only 27 percent of Educators believe their finances will improve under the new presidential administration, compared to 42 percent of all investors who feel that way. Future financial issues prey on the minds of Educators more so than it does on other investors. Fifty-three percent of Educators express concern over the financial situation of children and grandchildren, and Educators are more likely to express concern over financing the education of their children and (even more) the education of their grandchildren. 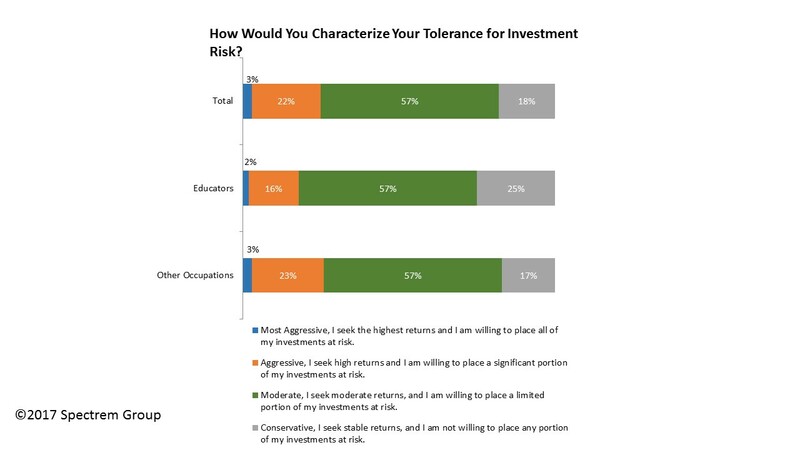 In both cases, Educators are more concerned than other investors. What does this mean for advisors? Working with investors from the Educator segment requires careful consideration of every investment move. For Educators, investments need to address their concerns over future expenditures with a solid pros and cons approach to explaining the investment to the investor. Educators are far more likely than investors in other occupations to consider the reputation of the company they are investing in, and the past track record of similar investments. Again, this indicates the care with which Educators make investment decisions. It is also instructional to know that Educators are much more likely to want to use their wealth to help those less fortunate. Thirty-four percent of Educators expressed that desire, compared to only 23 percent of all investors. Many Educators are likely to see the need for charity and socially responsible investing on a daily basis in their workplace. Educators are a careful lot when it comes to investing. They are also educated, and know how to educate themselves if they are missing information or unsure about what they are told. Advisors need to consider the caution with which Educators approach investing. That being said, Educators also have the need to balance their pension with their other retirement income streams, including Social Security, to have the most effective retirement plan. Advisors can assist them in making the most of the money they invested in their long-term plans.